Nope, it’s not something that will make you automatic cups of coffee when you’re still struggling to write that novel. What it is, is a machine that will print your book n demand. Yes, that’s right, your book. And it will print it in a proper library style paperback edition, with a glossy full color cover. I’m told that the cost of doing this is around what you’d pay for an actual book, but who cares? If you can actually have your book in your own hands…oh, the joy. I suspect that come December 1, when the participants in NaNoWriMo come out of their lairs clutching a disk, memory card or flash drive with their novel on it, there will be a rush to use this machine. I am planning to print my first horrible draft with large margins, so I can edit a hard cover instead of doing it all on my computer. It will be like having galley proofs. There are only about 50 of them in the world, so we are fantastically lucky to have one right on our doorstep! 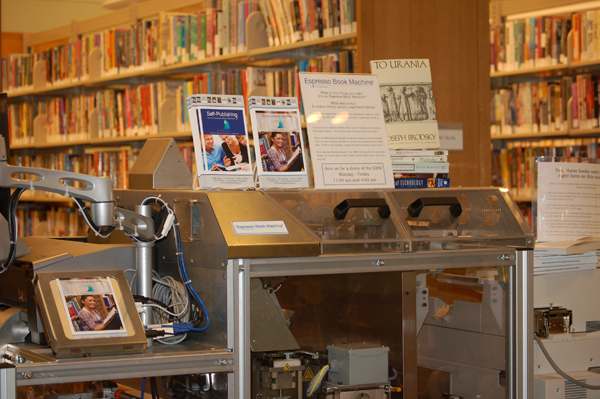 The Darien Library launched its Espresso Book machine yesterday, and I was there to see the first customer print a book. This one happened to be an out-of-print title called Twelve Years a Slave – the Narrative of Solomon Northup. A mother was printing it for her high school junior, since there wasn’t a copy to be had anywhere. The 325 page book cost $17 including tax, and printed in about 5 minutes. The charming young attendant, Bronwen, will be there to help you print your novel for the next few weeks, after which her trained replacement will take over. I can imagine handing those doubters among my friends and relatives an actual copy of my novel as a Christmas (or any other) gift. That’s my shopping taken care of. And the fact that the novel is no good yet (I won’t have rewritten it in time) isn’t going to stop me. They’ll just have to suffer. This is so neat! I wish my library had one. I don’t know where you live but if you check the link for ondemand books they have a list of them around North America. And the rest of the world too I think. If not it’s back to online printers lke Lulu.